Oscar Espinoza, of Modesto, California was out with his metal detector in a woods creek in Jamestown when he struck gold. He uncovered an 18-ounce nugget. The estimated value is $70,000. The find has been placed somewhere away from his residence for safekeeping until it will be sold. Bryant Shock, a local business owner, said it was a rare find and he believes it will spark collectors' interest, resulting in driving the price up four or five times. The nugget is more valuable in its original form because it's a piece of history and if it is melted down, only the metal will make up its value. British Museum curator Richard Hobbs said the silver Roman pendant is a very rare and valuable find. 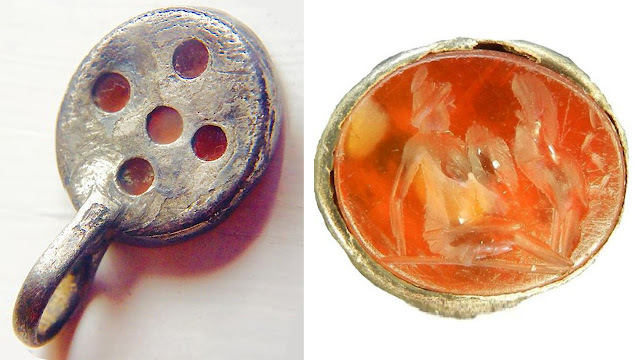 It dates back 2000 years and is set in an orange carnelian stone, engraved on the front is a fallen soldier or gladiator holding a shield towards what appears to be a large feline, likely to be a Panther. At the back, it features five circular cuts in the shape of a cross. 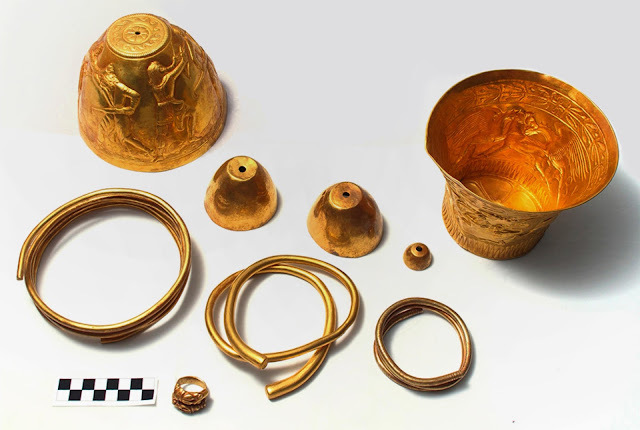 Experts believe it belonged to someone wealthy. A large Roman military garrison was stationed once in Chester and the jewelry was found outside the city walls. The pendant has been ruled a treasure and will be on display at The Grosvenor Museum in Chester following valuation by the British Museum. Half of the money will be paid to Mr. Sansom and the other half to the landowner of the field where it was found.